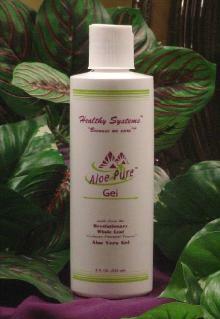 Aloe Pure� Gel� 8 Fluid oz. Helps provide soothing relief from skin conditions such as sunburn, abrasions, insect bites, diaper rash and other skin problems from A to Z. Aloe Pure� Gel assists to promote skin healing threefold. Aloe Pure� Gel is virucidal, bactericidal, fungecidal, anti-inflammatory, anti-biotic, anti-septic and has the properties for promoting the removal of dead skin while stimulating the normal growth of living cells. Use as a shaving cream. Use on all skin conditions. Use on cold sores ...fever blisters. Suggested Usage: Apply generously to skin and rub onto appropriate areas and let dry. Then reapply as often as needed.